The team from Morgan Sindall has visited Elements Europe’s manufacturing site to approve a prototype for its New Bailey PRS development in Manchester. 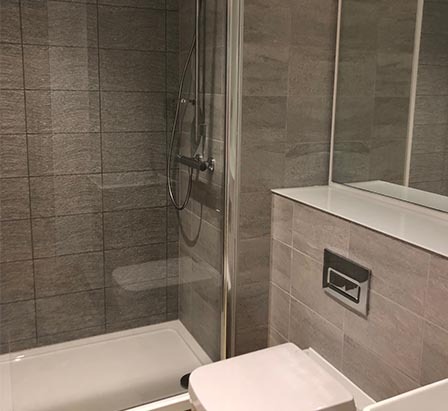 The bathroom pod prototype has been manufactured to the exact specification of the client and features large textured grey tiles, Porcelanosa wall hung WCs and sinks, Hansgrohe brassware and large mirrors. The prototype was also manufactured floorless as will the full order of pods, to enable a continuous floor finish throughout the apartments. 300 bathroom pods of five types will be manufactured for the 21 storey PRS tower. “Now that the prototype is approved we look forward to fulfilling the full order and working alongside Morgan Sindall again following the successful collaboration for a modular student scheme in Chester” commented Kevin Arthur, Director, Elements Europe. Two tower blocks have already been built at the New Bailey development named the Slate Yard, this final phase will be the tallest of the three blocks and will offer 199 PRS apartments including 98 one bed apartments, 81 two beds and 20 three bedroom homes. New Bailey is a joint venture between Muse Developments, Legal & General and Homes England through the English Cities Fund.